I used 2 pieces (1 lb ea.) of bluefin tuna. Brine for ~2 1/2 hours, rinse in cold water, pat dry. Air dried for an hour. I put the fish on the smoker at ~180-200. 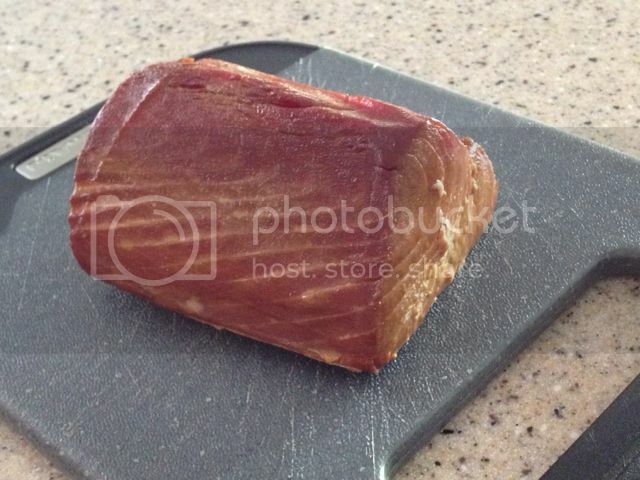 Put a digital thermometer in one filet and smoked until internal temp of 140. Took about 3 hours. It is. It came out a bit dry which is why I'd take it off a bit sooner. But the taste is wonderful. Going to have to try this.. I did a brine for the first time but added way too much salt. Nevermind watching your wake... you'll just end up hitting a rock. I love Hot Tuna. I saw them in concert back about '73. I also love hot tuna. Don't have a smoker but wondering if wouldn't work as well on grille. I have used a kettle grille as a smoker. I just used a very small amount of briquettes (probably around ten, but it's been a few years),and built the pyramid off to one side. I would add another briquette or two when the temp started dropping. Eventually I put a couple bricks down the center to avoid as much direct heat as possible. Worked fine for a long time, but the space was very limited. I definitely couldn't put two pork butts on there. Man sounds great!...I love smoked fish....3 hours = 3 martinis? I like the way you drink . . . er . . think. Are you sourcing bluefin locally? I've revisited this thread multiple times, and was thinking about giving it a shot. However, I'm only finding yellowfin locally here. I guess my question is: Does anyone here know of a reputable online source for bluefin? Or, is it generally just a bad idea to try to ship it? A good friend of mine who does multi-day fishing boat trips came back with a crapload of fish. He passed along ~100 pounds of fish to the S.H.I.T. herfers. 80-90% of it was bluefin and yellowtail. 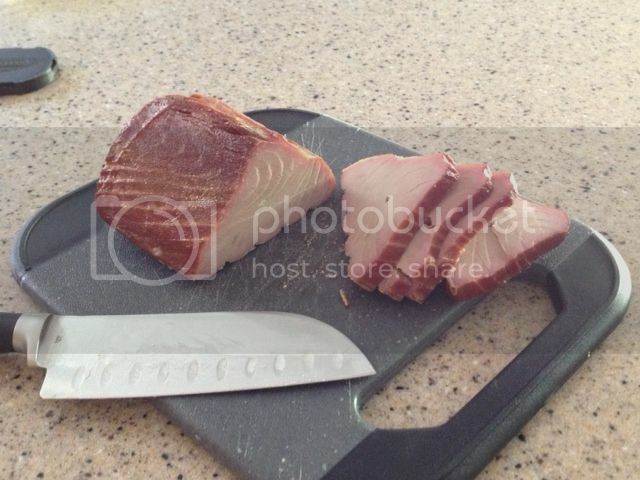 I will be trying a batch with yellowtail soon. I can't comment on the feasibility of shipping. But I can tell you that the fish we received was frozen shortly after being caught and cleaned. I defrosted overnight in the fridge and went from there.